Keratoconus is a progressive eye condition that affects the cornea (the clear window at the front of the eye), causing visual impairment. It is a relatively uncommon condition, affecting approximately up to one person for every 500 in the general population. It has been estimated that for every 100,000 people, there will be 2 new cases every year. Around 10% to 25% will eventually need some form of surgical treatment due to the progression of the disease. SO WHAT EXACTLY IS KERATOCONUS? 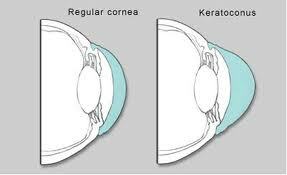 Keratoconus is a corneal ectasia, where the center of the cornea becomes progressively thinner with time. 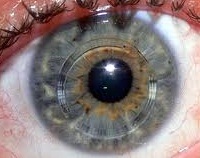 Due to this thinning, the cornea is unable to support the normally round shape of the eye. This causes the cornea to bulge forward and form a cone-like shape. In normal eyes, light is focused sharply by the cornea and the lens onto the retina. In eyes with keratoconus, the bulging and thinning of the cornea distorts the focusing of light. This causes the vision to become distorted and blurry. As the cornea becomes thinner, it becomes more distorted and irregular. This causes progressive myopia and irregular astigmatism. You may find yourself having to increase the strength of your spectacle correction frequently. Apart from blurry and distorted vision, you may also experience symptoms of glare and light sensitivity. This condition is usually present from birth, but will only affect the vision from the teenage years onwards. In most cases, it starts to become apparent between the ages of 16 and 30 years. In some, it can become manifest as early as 8 years of age or even as late as age 45. Stabilization occurs by around age 50. Typically, both eyes are affected. However, how quickly the eyes progress are often unequal. It is therefore common to have more advanced and severe disease in one eye compared to the other eye. Please note that although you may become significantly visually impaired, you will not become totally blind from this condition. No one really knows, although a recessive gene has been found and there may be other related genetic components. If you have keratoconus but there is no previous past family history of it, then the chances of your children being affected is less than 10%. In the cornea, there is an imbalance of enzymes that protect against damage from free radicals. 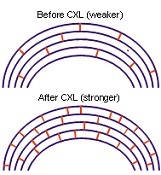 As the cornea becomes progressively more damaged, it becomes thinner, weaker and bulges forward. Other possible risk factors include seasonal allergies (hayfever, eczema), asthma, Down syndrome, Marfan syndrome, poorly fitting contact lenses and excessive eye rubbing. HOW CAN KERATOCONUS BE TREATED? In the early stages of the condition, spectacles or custom soft contact lenses (such as the KeraSoft lenses and the NovaKone lenses) will be able to adequately correct your vision, but may need frequent updating. As the cornea becomes thinner, you may find that your vision remains a bit blurry or distorted despite the best prescription. There may also be a huge difference in power between your prescription lenses. In the more severe cases, rigid gas-permeable contact lenses are required. Rigid lenses vault over the cornea, bypassing the irregular corneal shape and replacing it with a smooth, uniform shape that improves focusing and vision better than soft lenses. Rigid contact lenses may be uncomfortable to wear and can be quite challenging to fit. To reduce these difficulties, you may opt for hybrid contact lenses (such as the ClearKone hybrid contact lens) or scleral lenses (such as the Boston Scleral Lens Prosthetic Device). 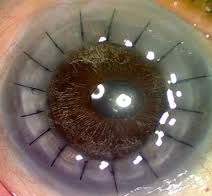 Intracorneal rings (corneal inserts) are tiny plastic rings that are placed in the periphery of the cornea to reshape the cornea (see right) for clearer vision. They can be removed and replaced as needed as the cornea becomes progressively thinner. Currently, Intacs is the only FDA-approved intracorneal ring available for the treatment of keratoconus. Corneal cross linking uses Riboflavin 0.1% (vitamin B2) eye drops and ultraviolet light A irradiation to increase the number of collagen bonds in corneal tissue. This strengthens the cornea and maintains its structural integrity thereby delaying progression of the disease and stabilizing vision. This is a very exciting new treatment option, and is currently undergoing major clinical trials in the United States and Australia. Corneal transplantation is required when there is significant corneal cloudiness or when contact lens or other treatments are no longer able to correct vision to an acceptable level. Newer techniques have now improved the outcomes of surgery, although transplant complications can still occur. You will most likely still need some form of vision correction with spectacles or contact lenses after a corneal transplant.